Go for a grey print long sleeve t-shirt and a grey tulle skirt for your darling for a beautiful casual get-up. Old west round toe fringe western cowboy boot child from shoes.com are a wonderful choice to complete this outfit. Consider dressing your little one in a grey star print sweater with a grey skirt for a comfortable outfit that's also put together nicely. 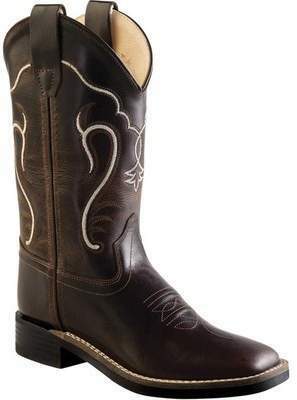 Old west round toe fringe western cowboy boot child from shoes.com are a savvy choice to round off this outfit. This combo of a white long sleeve blouse and brown shorts is both a functional and fashionable choice for your little angel. Old west round toe fringe western cowboy boot child from shoes.com are a wonderful choice to finish off this look. For an everyday outfit that is full of character and personality suggest that your tot dress in orange polka dot dress. Old west round toe fringe western cowboy boot child are a savvy choice to round off this outfit.